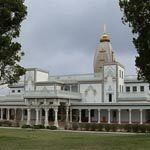 Barsana Dham is one of the largest Hindu ashrams in America. The International Society of Divine Love was founded to spread the teachings of Jagadguru Shree Kripaluji Maharaj. At Barsana Dham a practical process of meditation, chanting and remembrance serves to unite the soul with the Supreme power of God.